Very scared I was when I first saw these peppers at a friend’s barbeque. 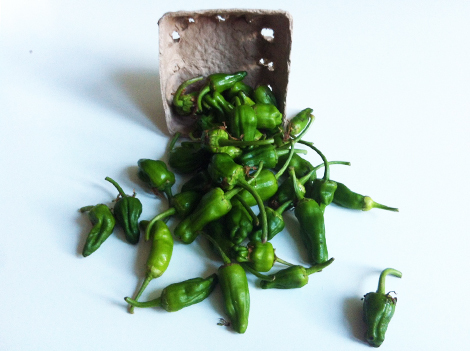 I am not typically a pepper fan; bell peppers are gross, and these bad boys look like jalapenos! But I was told these aren’t spicy, and was encouraged to give ’em a try. 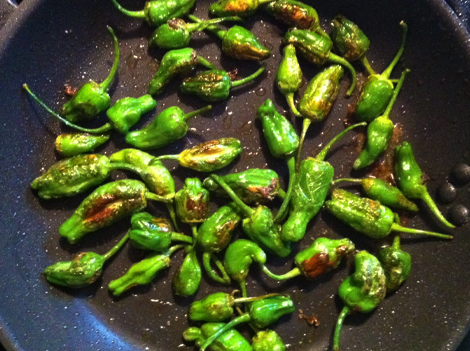 Wow were they good, and padron peppers became my new favorite ish. Good thing they are easy to cook! 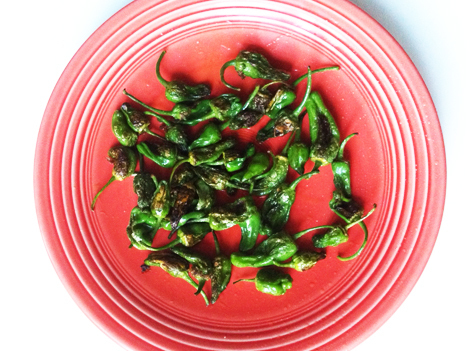 The hardest part of this recipe is finding padron peppers. I had to go to three separate markets to find these guys, but it was well worth it. You’ll have the best luck at a specialty market, Mexican grocery store, or Farmer’s market. 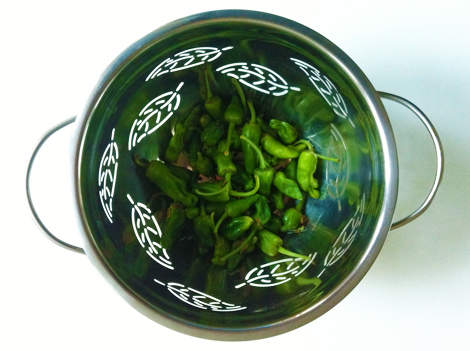 Once you find and buy the peppers, give them a good wash.
Pour some olive oil into a frying pan and turn the stove onto medium heat. The oil should be really hot before you add the peppers. You’ll know it’s ready when the oil starts crackling. Add the peppers, and sauté them in olive oil until well cooked and they have started to brown. BE CAREFUL! The hot oil will splatter and try to attack you once the peppers enter the mix. Use protection – cook with a shield! Sprinkle some sea salt onto the peppers and remove them from the pan. The recipe is now complete! This dish makes a great party starter, hors d’ourve, snack or side dish. You can eat the whole pepper, but maybe leave out the stem. Be warned, there is usually one hot pepper in the bunch. This only makes the consumption process all the more exciting, for picking and eating the hot pepper is good luck. 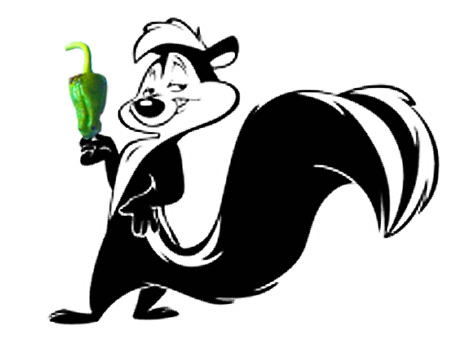 😉 Right, Pepe? What a great recipe. These cute little peppers are quite tasty. You might think they will be too hot to eat, but they’re not. What a treat,!